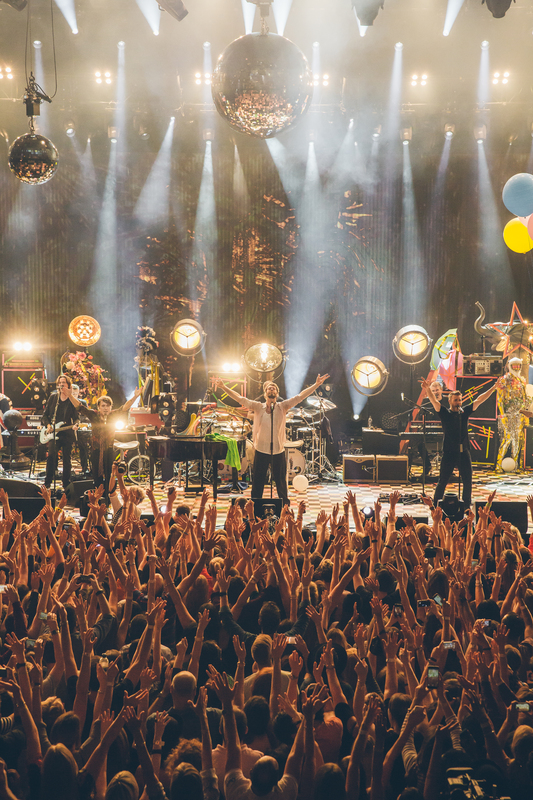 After a rousing opening night set from Ellie Goulding, it falls to Mancunian veterans Take That to headline day two of the Apple Music Festival. Before they get underway, proceedings begin with a support slot from New Jersey born Charlie Puth. The 23 year old rose in popularity via YouTube, and lets the crowd know that it's only his second time in the UK. He has a natural charm on stage as he positions himself behind a grand piano. Accompanied by a live band, he plays soaring ballads which reminded me of Britain's Tom Odell. One highlight is 'One Call Away', a song which he explains is about long distance relationships. He displays a fragility but plays with such confidence, creating a wonderful juxtaposition. A second highlight for the lucky ticket holders in attendance this evening is his first UK number 1, 'Marvin Gaye', which gets them moving. There are a few blips in the half hour set, his cover of Calvin Harris' 'How Deep Is Your Love' doesn't add much, but on the whole the set is a pleasure. It culminates in perhaps his biggest hit so far, the deeply moving 'See You Again' from the Fast and Furious franchise. Although Puth did not know the subject of the song, Paul Walker, he comments that he drew from personal experience to create a song to honour Walker's legacy. To say he achieved this is an understatement. Puth has written a deeply affecting song and it is a pleasure to see him play it live in such a beautiful setting. He tells us earlier in the set that he moved back in with his parents to kick-start his career after college, it's safe to based on his set that he won't be moving back in anytime soon. As the crew clear the stage in anticipation of tonight's headliners, it's the first time we catch a glimpse of the spectacle the band have in store for us tonight. It's flanked with all sorts of interesting and peculiar items. There is a zebra, balloons, a huge hand, palm trees and a whole host of other items. As we approach their set time, there's an anticipation in the air, whilst Saturday's headliner Ellie Goulding blasts out throught the speakers. With a few minutes to go, their band arrives on stage and are shortly followed by the trio of Gary, Mark and Jason, and Take That kick off their headline set to rapturous applause. Wasting no time, the band open with 'Beautiful World' single 'Shine', the first of many hits they'll play tonight. There's a wonderful dynamic between the three from the beginning, something that isn't as easy as it would seem when you've spent roughly 16 years as a band. They appear to be having a fantastic time, and as they launch into 'Greatest Day', so are the crowd. 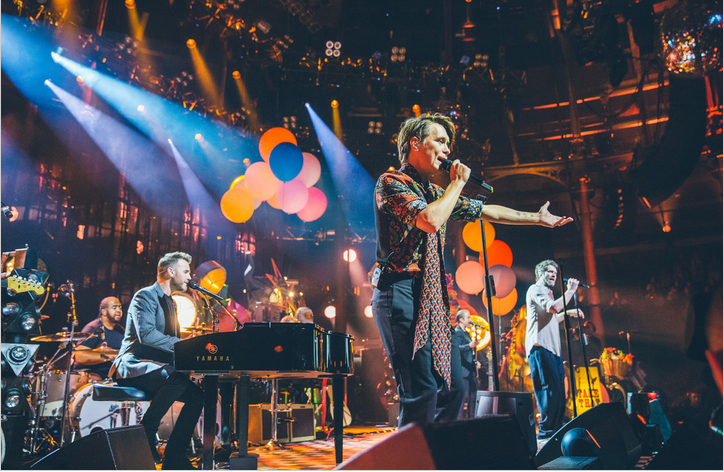 All three are natural performers, with Mark Owen embracing a dedicated crowd numerous times as they sing the tune emphatically. From here, the band enter into newer territory, playing the first song from their most recent album, and first as a three piece in 'Get Ready For It'. It's admirable how the band, who've been around since the early 1990s, maintain such a relevant sound decades later. Lyrics such as "the night is young, until it's over" feel like a call to arms to the crowd, and it proves right. We may be a mere three songs in but there's plenty more to come. 'Hold Up A Light' and 'Patience' come next, with Barlow taking somewhat of a back seat on the aforementioned, Owen and Donald shine, with Owen jumping into the crowd to embrace some that have apparently camped out since the early hours of the morning. The band keep their between song chat brief, stopping to ask us to say hello to those watching around the world and remarking on their joy to play the wonderful Roundhouse venue for the first time in their career. Barlow then asks if anyone in the crowd is old enough to remember the 90s, and it would seem a few are, as 'Pray' gets a big reaction. We then enter a more stripped back portion of the set, allowing both the band and crowd to have a break. The give 'A Million Love Songs', 'Babe' and arguably one of their biggest hits 'Back For Good' the stool treatment. 'Back For Good' sends the crowd into a frenzy and is a true highlight of the night. 'These Days', a recent #1 hit is probably the most fun of the night, showcasing a wonderfully loose vibe. The trio have a choreographed dance along to the song which goes down a treat. Before we know it the set appears to be coming to an end, as they tell us they have one more, before hinting that another may follow. 'Rule The World' is up first and is followed with confetti canyons and a huge reaction to 'Never Forget'. They have the crowd in the palm of their hand at this point and it proves a truly special end to a night full of some of the biggest hits Britain has seen. Seeing a band as distinguished as Take That play a venue so intimate proved to be nothing short of a treat. They somehow manage to fit in almost every hit into their hour long set to the delight of the crowd of lucky ticket winners. It's worth noting and maybe obvious that the band is now reduced to a trio, but it hardly matter when they are such a tour de force. This ensures that the Apple Music Festival, again wonderfully at home in a real gem of the capital in the Roundhouse, goes from strength to strength.